A Engineer and an Programmer are sitting next to each other on a long flight from LA to NY. The Engineer leans over to the Programmer and asks if he would like to play a fun game. The Programmer just wants to take a nap, so he politely declines and rolls over to the window to catch a few winks. The Engineer persists and explains that the game is real easy and a lot of fun. He explains "I ask you a question, and if you don't know the answer, you pay me $5. Then you ask me a question, and if I don't know the answer, I'll pay you $5." Again, the Programmer politely declines and tries to get to sleep.The Engineer, now somewhat agitated, says, "OK, if you don't know the answer you pay me $5, and if I don't know the answer, I'll pay you $50!" This catches the Programmer's attention, and he sees no end to this torment unless he plays, so he agrees to the game. The Engineer asks the firs t question: "What's the distance from the earth to the moon?" The Programmer doesn't say a word, but reaches into his wallet, pulls out a five dollar bill and hands it to the Engineer. Now, it's the Programmer's turn. He asks the Engineer "What goes up a hill with three legs, and comes down on four?" The Engineer looks up at him with a puzzled look. He takes out his laptop computer and searches all of his references. He taps into the Airphone with his modem and searches the net and the Library of Congress. After about an hour, he wakes the Programmer and hands him $50. The Programmer politely takes the $50 and turns away to try to get back to sleep. 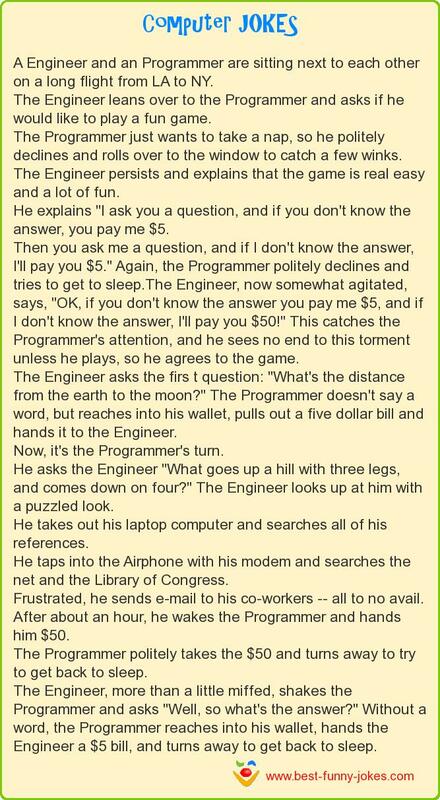 The Engineer, more than a little miffed, shakes the Programmer and asks "Well, so what's the answer?" Without a word, the Programmer reaches into his wallet, hands the Engineer a $5 bill, and turns away to get back to sleep.